He's earned medals in the military and at the Covenant Health Knoxville Marathon. Now he is ready to race again. KNOXVILLE, Tenn. — Runners will take to the streets for the Covenant Health Knoxville Marathon. 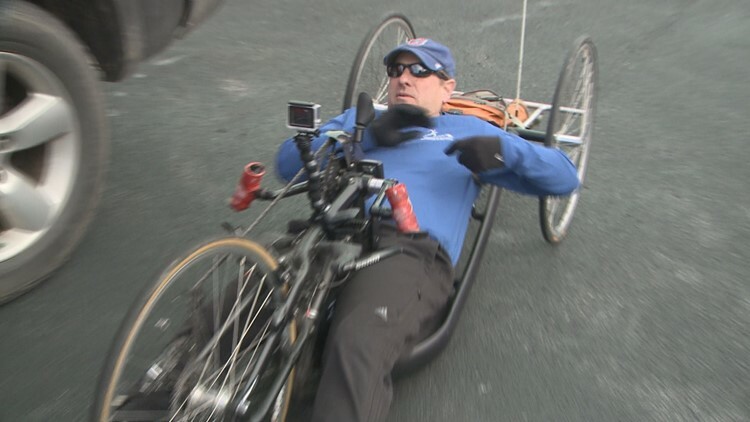 In addition to those running the marathon, half marathon, or 5k some competitors will race using handcycles. We caught up with one of those athletes who is also a veteran. Now he handcycles but David Neumer used to bicycle and run. He was in great shape in the United States Army Special Forces until one particular mission in Afghanistan in 2009. "We were on a mission up in the mountains, we were part a large mission with the French, during that mission we got engaged with the Taliban and during a firefight I was hit by an 82-millimeter mortar," David Neumer said. "I didn't really realize how injured I was until I was about three weeks at Walter Reed and I could finally assess myself and realized I had gotten myself into a lot of trouble." His right leg was shredded, his knees full of shrapnel. And he suffered a traumatic brain injury. He discovered hand cycling during two and a half years of rehabilitation at Walter Reed Hospital. "I picked it up and it was great because it was my cardio again and it was the same sensation as running. I just picked it up and while I was there an organization took us to the Disney World half-marathon and I experienced my first competition and it went from there," he said. The veteran who was awarded the Purple Heart, Bronze Star, Legion of Merit, and French Cross of Valor... also earned two medals at the Invictus Games in Orlando in May 2016. And he's also placed first and second at the Covenant Health Knoxville Marathon. Because of injuries he's taken two years off from competition. "This will be my come back race at the Covenant Health Knoxville Marathon," he said. For the first time, the Covenant Health Knoxville Marathon team is made up of all veterans. Dennis Clark, who is also a handcyclist, invited David to join the group. They train with the Knoxville Track Club, Coach Missy Kane, and personal trainer Chris O'Hearn with Fort Sanders Health and Fitness Center. "You've got a team now and so you want to do well for the team. you want to be a part of that and make your contribution," he said. They get together for strength training and core building. David focuses on the upper body. Veterans from different branches of the military who have a lot in common. "We have the same language and have gone through similar experiences. So it definitely makes a difference," he said. His goal is to finish the full marathon in under two hours. "I've got to pace myself to make sure I've got something for the end. That's the big unknown right now is how my endurance will be for the entire race." It's a race this Army Veteran intends to finish strong. The marathon is Sunday, March 31. WBIR will have extensive coverage that day and we hope you will join us.